Do you notice a skin rash or the smell of rotting raspberries? Then you might have a bed bug problem! Bed bug bites can cause skin rashes, psychological effects, and allergic symptoms. If you smell the scent of rotting raspberries then that means a massive infestation of bed bugs has taken place. Don’t wait to call a pest control company that you can trust right away! Bed bugs were almost eradicated in the developed works in the early 1940s, but they have made a big comeback since 1995! This could be due to pesticide resistance, international travel, or many other reasons. 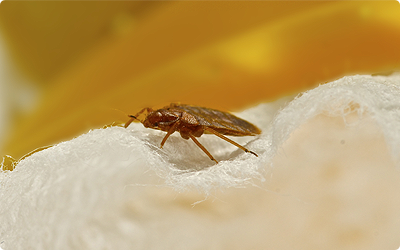 These pests are parasitic insects, and the best known bed bug is the common bed bug, Cimex lectularius. They are a part of the cimicid family that feeds exclusively on blood. 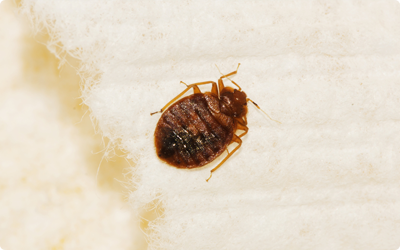 A bed bug can survive on domestic cat or dog blood, but humans are the preferred host of the common bed bug. A bed bug only needs to be attached to its host for a short period of time. Once done feeding, the critter will relocate to a place close to the host for future feedings in a group of adults, juveniles, and eggs. Near animals, like bats, birds, or rodents. And of course, your bed is another place you can uncover these creatures! Don’t let bed bugs drive you out of your home or business! A & J Pest Control is a family-owned and operated business with over two decades of pest control experience. We can inspect and treat residential and commercial properties for many types of pests, including termites, bed bugs, spiders, and ants! For a list of other pests we can control, check out our Bug-o-Pedia!